Choose the best for your chafers with Choice 6 hour chafer wick fuel! Capable of producing 890 BTU's per hour, its wick design and non-flammable liquid diethylene glycol fuel promote safe burning and help to keep the can cool to the touch even during use, while still providing a consistent, long-lasting flame and approximately 6 hours of burn time. The end result is high-quality heat that burns hotter than comparable wick fuels, burns safe, and lasts long. For convenient storage when not in use, this can features a screw cap top. The last case of dish fuel that I got was extremely hard to open. I had to actually bust out a tool chest, and I'm a strong guy! Impossible to open on the fly at a catering event, for instance. The product works great tho, once you open it. This is the best deal around on 6 hour chaffing fuel. Works great for caterings and not much more than the 2 hour cans. There is nothing more embarrassing than finding out your chaffing fuel is empty and you have been serving cold food. Great choice on the 6-hour chafel fuel....I did not need to use another fuel because the 6 hours held up to its promise...I was very pleased!! I purchased for a Memorial Day event for 75 people, I only need to use 15 fuel chargers. Great for heating up WARM FOODS. This will not heat up, frozen foods, it's perfect for OUTDOOR bbq, for small- mid size gatherings. The price and shipping were perfect, and the best prices anywhere. No leaks, and no duds, in teh case. These chafing dish fuels are great for long events. They last the full 6 hours keeping the food hot. I would highly recommend this product. I purchased the 6 hour chafing fuel because they lasts longer and would not have to be changed out during my event. They burned the entire time (4-6 hours). Kept all my dishes steamy hot! This arrived in such a big messed. The box is soaked with fuel. Customer service replace it right away. I will order some more in the future. Thank you webstaurant for keeping your customers happy! These worked perfectly! We lit them at 2pm and at 6pm when we started to wrap things up at the dinner they were still burning strong. I can actually see getting at least another 2.5 hours out of what was left. Buying these saved me a grip! It’s much cheaper than purchasing in the store. They were easy to open and light . They stayed lit for six continuous hours. These chafer fuels are pretty standard. The safety twist cap is difficult to remove at times, especially if you are stressed/in a rush. They are great for our 2 hour long catering events. Have only used these for one event so far, but they worked well. We might use an extra one on our next event to increase the heat available. The best chafers we've come across. Puts off a great strong flame that lasts a long time. Heats our food up consistently. We prefer wick chafers over gel. Love this Chafing fuel.... It last the full 6 hours as advertised. They are easy to light and rarely go out. I only have one complaint and that is they leak if you don't tighten the snot out of lid when you are finished. Quality product without the expensive price. Lasted more than 6 hours and easy to reuse if you don't need them the entire 6 hours that they burn. Would definitely purchase again! These sternos were safe and relaible. The covers made it easy to keep safe after we were done with them for the night. I would recommend. Chafer Wick Fuel is a great product to keep chafer warm. It keeps very well for 6 hours. We use this product with all our equipment. these chafing dish fuel are a life saver. it comes in handy for catering jobs weekends. i just purchase it recently so far works great. highly recommended it. Although it comes with a safety twist cap, I still found it to be the most difficult to open. It actually requires you to use pliers. I don't see me purchasing these items again for that fact alone. However I am giving it three stars solely on that Once you get it open they burn very evenly. Thank you for your feedback! We’re sorry you did not prefer the cap to this chafing dish fuel. For recommendations, please contact our Customer Solutions team. I love how these dish fuel lasts 6 hours. You get a pretty good amount for the price. It keeps your food warm for a long period of time. Oh my gosh these things work amazing. The best that comes off is so strong and last a litle longer than 6 actually I think 30 minutes more. Love this fuel. Much more economical than those available at the local retail stores. True 6 hour burn time. Great value for a simple product. Would love to give the product 5 stars, as they performed as described, burning for 6 hours and with a safety twist cap. Arrived as advertised. However, be aware that the "safety twist cap" is very, very tightly capped and it took a few minutes to uncap each one, versus other types of chafing dish fuel which have lids that pop off a bit easier. This chafing dish fuel is great. Great price easy to use and convenient for the super bowl party or any other party to keep food warm. I'm glad that I purchased this for my chafing dishes, it works great, it keeps my food warm for 6hours. I will definitely buy this again and recommend to my friends who used chaffing dishes. These will burn for hours and they ROAR!! my tops were hard to get off. I had to pop them off with a bottle opener. Even though the canisters didn't seem full, they burned for the time intended. These chafing fuel dishes work well. We used them for a catering event and they heated up the water for the chafing dish very quickly and we were able to get the food temp well above 135 degrees so we were able to serve the food safely as well. They are a bit tricky to open, but easy to use besides that. Impossible to open by more than 5 people, wasted time and loss money. I opened this box at an event with more than 3k people. Its almost impossible to get these to open. I asked event helpers as well as other food vendors. After maybe an hour, we were able to open them with knives and water (don't ask). These definitely cost us money! These fuel containers with wicks burn so clean that you can't easily see the flame, but rest assured, they are doing their job! The fuel lasted for just over 6 hours and did a fine job of heating water under a food tray in a chafer. It should be noted that these containers are extremely difficult to open. You will need to have something to help you grip the twist cap - and you will need a lot of strength! A fabulous choice for events requiring chafers to be hot for a long time. As much catering as we do we use the 6 hour fuel a lot and very efficient for a wedding or shower function, with fuel to spare, very clean burning also. this fuel is just what I needed to keep food for a long night party warm . they lasted through the program and everyone was happy the food was still warm when ready to eat. I've been very pleased with the Choice 6 hour Wick Chafing Dish Fuel!!! I've used them for weddings and personal parties and after using a case of them they've all burned for at least the 6 hour advertised time. Very satisfied. I'll be purchasing more!!! These are a great price and work just as well as sterno brand. Being able to get them in bulk with a discount is great too! We use this fuel for every dinner that we host & have never had a problem with any of them. They last just like they are supposed to & are easy to store & reuse if the full 6 hours wasn't utilized. Will definitely buy them again. We use these repeatedly for our buffets and private parties. The time on them is very reliable. They cool down quick once you put them out so no burns. I gave 4 stars bc they’re so hard to open, you will need to use pliers/wrench, others wise you can’t open them, also open prior to your event. They burn around 5.5 hrs. I am completely satisfied with my purchase, it’s a great product, no issues with function. Definitely a great product, once you get them open, lol. This product works as it should. It lasts long enough for all of my functions and burns easily. I wish some were a little easier to open but I understand why they are so tight. I ordered these fuel cans due to the price. Webstaurant has them for a much better price than my local food purveyor. We use fuel cans a few times a week on buffets and app tables, and these perform as good or better than the ones I can get locally. I will be ordering these regularly. I bought a couple of cases of this stuff. I've found that the 6 hour cans last closer to 4.5 hours at most. I've had a few events now, where we needed 10 hour operation of our chafing dishes as it was an all day event, and 9 hours into the event, we had already gone through 2 sets of cans and had to start a third set. Luckily I had brought more than enough. That said, these really should be classified as 4 hour chafing dish fuel. I'll still use them. I just know what to expect no w.
We appreciate your review, Brad! We are sorry this fuel did not meet your expectations. If you are looking for a different recommended product, please contact our Customer Solutions team. 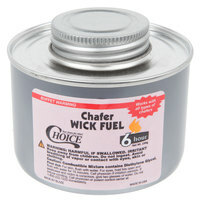 this Choice wick fuel is essential for reliable chafer heating. Its wick design and non-flammable liquid diethylene glycol fuel promote safe burning that is also easy to light. Im not too pleased with product, it doesn't seem like i have been getting the full 6 hours of burn time on any of them. Thank you for your feeback, Ryan! We are sorry you did not prefer this product, please contact our Customer Solutions team for recommendations! I am really happy with this purchase. By far these are the best that I have ever used. I will definitely be purchasing again in the future. This product is great when it comes to needing a long burning time. Arrived on time without any leaking from the containers. Can easy recapped and used for a later time, if fuel still remains. Finally a sterno can you can open! These were not only easy to open but easy to light and burned very clean and for the full 6 hours in some. These 6 hour sternos will not disappoint you! We use them for drinks as well as food, and they last the full time they advertise. Great product, lasts the six hours. The pricing is excellent and I always add to an order. Do not order by itself because of the shipping cost. These were so easy to use - and put away, kept the food really hot! Buying the case is the way to go to be ready for next event - great value! I've tried many chafing fuels and the problem I have with most is that they don't last long. I also had a hard time finding 6hr ones. I mainly find the 2 or 4 hr so when I found this 6hr one, I was very happy. My only issue with is is that if the boxes tips even a little, the fuel tends to run out and can be messy. This was the first time to use the wick fuel. We typically use the gel fuel. The wick fuel was good, however I am not sure if it was as hot. The lid was also extremely hard to remove. I will probably purchase the gel next time. Great product, very durable and long lasting fuel better quality than one you would buy at other retail stores. Its also at great price for the quantity! We've used these for every catering event that we have done and then we also have served entrees with it as well. It doesn't very well with the typical ways of lowering the extent of the flame as the wick flairs up. You can't argue that this is a pretty good deal. I can buy similar products from other vendors and I get the same quality here for much less. Most liquid heat products that I have used usually burn out before I have completed my catering. This product goes all the way and is less expensive. I know this is very nit picky but they did not last for six hours. Some of the screw tops were difficult to get off. Overall good product. These work flawlessly and the price is right. Just used them on 2 catering jobs and they were perfect - kept the food nice and hot and gave off no smoke. Highly recommended! We purchased this for fuel for our annual Greek Fest. It is long burning and doesn't smell like some chafing dish fuel. We did get one case that had a couple of open cans that had spilled, but true to form, Webstaurant immediately took care of the problem by sending another case out. I wouldn't shop anywhere else for restaurant supplies. Don't last too long I only have it to start off with, but the price is ok. Will be ordering more later in the future. Sterno is priced competitively with other companies. It was nice to open my door and have them sitting g on my front porch ready to use. THANK YOU!! I needed the fuel for the chafing dishes and the box arrived on time and we will get to use them tomorrow for Thanksgiving. I asked for these before Thanksgiving and they arrived on time and we will have nice, warm food for the holiday. Thank you so much for your timely shipping and for the quality of your product. It is appreciated!!! Easy to light and unscrew. They also last the six hours that it advertises. We do not notice any difference when compared to the leading brand. We ordered these for an event. They kept our hot foods at the perfect temperature while people took time to visit and wander. The value was an additional win for us! I got a case of these for work. They all lasted over 6 hours of burn time. We used them indoors and I was happy they did not have the nasty oder that some have. Great product thanks. These were a show stopper for my party. Very safely placed under the food warmers. Beautiful setup for a beautiful ocassion. Very reasonable price too. Webstaurantstore.com offers these at a fraction of what our food/ supply purveyor sells them to us for. We have had zero issues with these. Once we run out of our stock, we most definitely will repurchase. Candles lasted for hours. The wicks where easy to light, and very easy to put out. Food stayed hot because of this product. Will purchas more. No complaints at all about this stuff. I will do exactly what you want it to do, if you can get it lit. What more could you ask for? GREAT PRODUCT!!! The fire holds for 6 hours as it states in the description, and this is actually my second purchase of this product. I will always purchase my catering supplies from this site because the products and prices are AMAZING! I used these at my nieces wedding and I didn't want to have to watch and keep changing out the fuel for my chafers. If you don't use all of the fuel it can be recapped and used for short events. I use these at the farmers markets and they stay lit and last thru the day. I like the ease of use and that I can put the lid on and reuse leftovers. Just what I expected it. Found them here for a great price. I also bought the folding chafer set. Webstaurantstore. Com is One stop shop kind of place I love it. We love the Choice Wick 6 Hour wick Fuel. Easy light up and turn off and the fuel truly does last for 6 hours. Great item! These little wick fuel work great and provide enough heat to chafing dishes. I used this for 4-5 hours of farmers market and they were still had enough fuel to use for next time. These are the best purchase for your money when buying chafing fuel. No matter the brand they never seem to heat for the full amount listed, which is why I went for a case of these for a 4 hour party. You can't beat the price they are sold for at webstaurant.com. Great combination when paired with the choice economy full size chafer with folding frame. Really long lasting, easy to light, and turn off. Make sure the height of chafers fuel holder clears it so then you can easily use the snuffer to kill the flame. Great price compared to what I found locally. Good chafing Fuel burners. We use these exclusively for an event venue that caters many meals a week. Wicks last as stated and can be relit. I ordered a case of fuel for my chafer dishes. Even though, I saved some money by buying in bulk I was disappointed that some of the fuel had leaked out of the cans during shipping. Hopefully packaging these items differently will help in the next time I order. What a great deal for these. We got these for our wedding, which we are half catering ourselves. Shipping was quick and the package arrived without any damage. You can't beat this chafer fuel for the price. We saved almost 50% off what we were paying through our food distributor and these babies actually last six hours. I purchased these chafing dish fuel for a very important function I was throwing. Initially I was scared they would leak but when i received them they were in perfect condition. They worked better then expected. I will reorder them soon. Great for heating up WARM FOODS, for small- mid size gatherings. The price and shipping were perfect, and the best prices anywhere. No leaks, and no duds, in teh case love it best price ever. These are very cost effective and work very well. They light easily and stay lite without any issues. I have had no issues at all with them and they last every bit of 6 hours. I haven't timed if these actually last 6 hours but they certainly last long enough for any reasonable banquet or catering. The price is the best we've found as well. These are good quality, although not sure if they actually can go for six hours. The cans seem to be only about half full of fuel, not sure if I will buy again. shipping was quick and received everything I ordered this product is easy to use and I like for I am able to reuse it over again. stays lit and keeps the food hot in the pans. This is what you need for long lasting heating of food. It kept my food well heated during my last party. I didn't need to add another dish after the first batch. These worked well. The only thing that I had a problem with was that one of the fuel dishes was leaking when they were shipped to me. No electricity and no propane required to run my chafing dishes which is a money saver and convenient because the chafing dishes can be set up anywhere. No more crockpots. I am happy with this product because of the 6 hour fuel capacity great for those having long parties and open house events. Our customers like buying just what they need instead of a case of smaller cans. this choice wick chafing dish fuel is a really easy product to use. fires up really easy and keeps food hot. great product at a great price. This is our third time using these wicks. I no longer go to the store to buy any. Webs have the greatest price and good quality wicks. Great product at a great price. Excellent on time delivery! Chose wick chafing fuel has many different uses, fuel for camping stove as well has a buffet food warmer. No doubt the price I paid the Webstaurant store for my 24 case of 6hour burn time Chafing fuel was the lowest price around and delivery was quick. These burned for a long time. I would say that I used them for 4 hours and none of them burned out. In fact, there's more for my next event. I will definitely order these again. The best prices anywhere. We run 2 buffets a week so these 6 hour fuels are perfect. They have always worked great for us at the Cruisin! We used these for my son's wedding reception just to be sure there wouldn't be any need to change them out after a few hours and it would be one less thing to worry about. They lasted beyond the 6 hr burn time!The only reason I would give it only 4 stars instead of 5 is because when we opened the box, 2 of the fuels looked like they had leaked out a little onto themselves, though the box was not damaged. If you have a long event, it's worth the money getting these 6 hr chafing fuels and to not worry! Thank you for your review! Please feel free to contact a Customer Solutions Representative if you have any concerns about your purchase. This is one of the best Chafing Fuel, I use this a lot because it does not get my Chafer black and hardly gets dirty. This product does what it is intended to do but on average we only get 5 hours burn time. Burns cleaner than other fuels and leaves very little residues. Burned for a long time. Kept my food hot for the anniversary party I catered. They were really easy to light. We purchased the six hour chafing fuel because of the best overall value. Since they come with a screw top lid, we just reuse the canisters until the fuel is all gone. Worked perfectly. We used this chafing fuel with the chafers we bought from webstaurant. Works great ! You can either use the whole container at once or shut off the wick with the cover and use it later. I ordered the 24 pack of chafing fuel with my order. The price is reasonable and it really does last for 6 hours. That means you don't have worry about replacing it for the whole party. This brand of chafing fuel is easy to twist off the top: compare to other brand. I would buy this product again. The burning time last a little long than 6 hours.. These fuel canisters did exactly what they are supposed to... heat food and do it for 6 hours. And you can't beat the price. Thanks! Choice is a great budget brand for chafer fuel. I like the wicks on these the best and you can't beat the price for the hour burn. These are excellent to use for the steam trays. the outside stays cool to the touch and the heat that is output from them keeps the water in the steam trays going. i would buy again. This is such a great deal for chafer fuel. I bought this for an event in February and had plenty to use for another event just last month, with some left over, very happy with this purchase and the quality of the product. Worked great, excellent price! Had a long event with no kitchen - food served towards the end. None of these burned out prematurely. Very pleased, would buy again. Unfortunately some of these lids got loose in shipping and spilled some fuel. I recommend taping the lids to the can. Otherwise they lasted somewhat less than 6 hours--maybe they weren't completely full. Held up in strong winds too. Thank you for reviewing this product! We apologize that some fuel spilled during shipment. Customer Service will be in contacting you to assist you. We heavily refer to these fuels whenever we are catering an event, and they have not let us down once! They are easy and quick to light and last for a pretty long time! Definitely recommend for your next event! These Choice 6 hour chafer fuel will last for a while with ease! Great for buffet lines and to keep small pans warm without being on a steam table!! Not sure we get 6 hours, but we do get great heat and never seem to run out at an event. I will look into the time it heats and re-post if it less than the stated time. These worked great for our off site catered events. Kept the soup warm and we love the price. I was buying them off of a different website for more a can! So happy i found these!! Choice 6 Hour Chafer Wick Fuel 24 / CS is a great product. The chafer fuelis great for offsite catering but disappointed they leaked out during shipment.